- How much does a new school website cost? We charge a one off fee of £500 for a pre-built school website and there is an annual hosting and support fee of £299 a year. - How much does a bespoke website design cost? 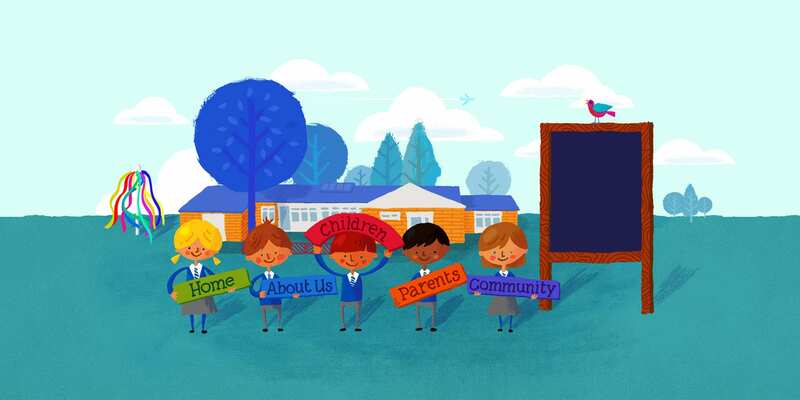 We charge a one off fee of £850 to design and build a bespoke website design for your school. There is an annual hosting and support fee of £299 a year. - Do you charge VAT? Yes. We charge VAT on all website service at the current standard rate. - We have not had a new website for ages - how does the process work? We know having a new website built is an important decision and we make sure we make the process as easy as possible for you. We cover the process on this page of our website How We Work. Please visit this page or give us a call on 01723 384525 and we will go through the process with you. - What is 'bespoke' website design? Rather than use a pre-designed template of a copy of a website we have built for another school, we build a website based on your design requirements. If you would like an illustration of your school we can draw this or maybe you would prefer a design that does not have illustrations and uses large photographs. We give you the flexibility to decide the design style you would like for your school. Our new school app is super easy for you to use and integrates within your existing school website dashboard. The controls are easy and intuitive and you can update key information on the app including your school name, contact details and which email address at school receives pupil absence notifications. Content delivered to the app is taken directly from your school website and includes calendar events, latest news and direct messages, which offers a potential cost saving if you are spending money on text message bundles. The app also includes an absence reporting tool for parents and carers to use. Making use of the latest technology has helped reduce development time and cost, which means we can pass this saving on to schools. We offer a text messaging service for UK schools. The cost to send one text message is 3.5p if you would like more information please call us on 01723 384525. - What is a Progressive Web App? Installable – Allow parents to add the app to their home screen without the hassle of an app store. Push notifications – this allows schools to send free messages direct to Android and Apple devices. Engagement – Parents are more likely to reuse the app, through features such as push notifications. Safe – Served via HTTPS to prevent snooping and ensure content has not been tampered with.